AppGratis one of the most used discovery app among iPhone users with more than 12 million iOS users have been pulled by Apple from the App Store couple of days ago. Apple claims it violates two clauses, first banning apps that promote other apps in a manner similar to the App Store, and second forbidding apps using push notifications to send advertising, promotions, or direct marketing of any kind. 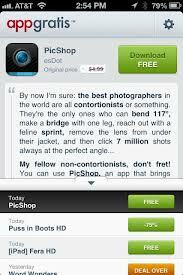 AppGratis, promotes paid apps by offering one for free everyday to users. AppGratis CEO Simon Dawlat responded to Apple’s move in a lengthy blog post.